Gayle Evans has more than 25 years of leadership experience in financial services and healthcare. For the past 10 years she has been employed at Unitus Community Credit Union and currently serves as their chief human resources officer. Previously, she worked in human resources for Pacific Health Horizons and Standard Insurance Company. 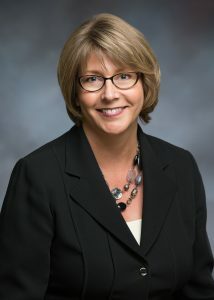 In addition to her role on WOU’s Board of Trustees, she serves in governor-appointed roles on the Board of Directors for the State of Oregon Patient Safety Commission and on the State of Oregon Task Force on Resolution of Adverse Healthcare Incidents. Evans chaired Oregon Business Association’s Health Policy Committee for eight years and served 13 years on the Operating Board of Directors for Trillium Family Services. She earned her master’s degree in management and organizational leadership from Warner Pacific College and a bachelor’s in business management from Marylhurst University.